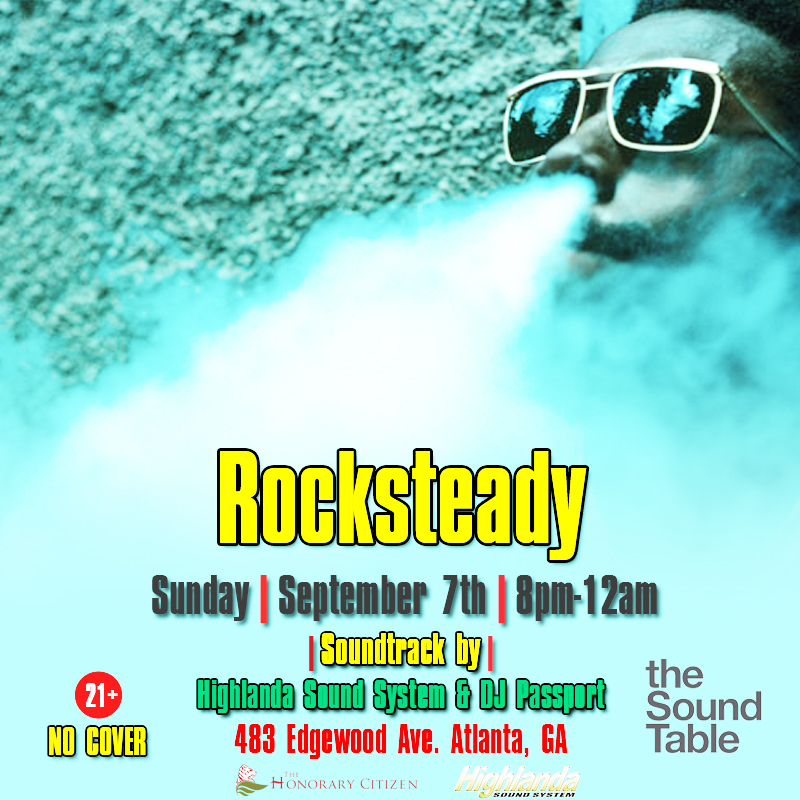 Rocksteady, a recurring festive occasion now being celebrated on 1st Sundays in downtown Atlanta’s re-born Old Forth Ward neighborhood presents a retro Caribbean soundtrack at a now classic locale, The Sound Table, located at 483 Edgewood Ave SE, Atlanta, GA 30312. This is a unique old-school style themed reggae soiree powered by Highlanda Sound System and DJ Passport. Enjoy world-class mixology infused with crucial music selection you won’t get at other spots in the city. Rocksteady is a music genre that originated in Jamaica during the late 1960s, after SKA and before REGGAE. Rocksteady and the early reggae that followed, was built around the “one drop” drum beat, characterized by a heavy accent on the second and fourth beat of every bar, played by the bass drum and the snare together. The bass line eventually became one of the most recognizable characteristics of Jamaican music. Despite its short lifespan, rocksteady’s influence is great as most of the reggae artists started out in Rocksteady and/or SKA. Many reggae songs became focused less on romance and more on black consciousness, politics and protest. The release of the film “The Harder They Come” and the rise of Jamaican superstar Bob Marley brought reggae to an international level that rocksteady never reached. Although rocksteady was a short-lived phase of Jamaican popular music (about 2 years), it was hugely influential on reggae, dub and dancehall. Many bass lines originally created for rocksteady songs continue to be used in contemporary Jamaican music, such as the rhythm from “Never Let You Go” by Slim Smith (sometimes known as the Answer rhythm) and the Hi-Fashion rhythm from “Bobby Babylon” by Freddie McGregor.